Oh my, Holmes and the Doctor battling the darkness together? I think that all of my dreams have just come true and all of my Christmas’s have arrived at once. While I know a lot of you are more than familiar with Andy Lane’s novel, you’ll have to forgive, and hopefully bear with, me because as I’ve already explained, I missed the Virgin New Adventures range as I’d briefly left the Whoniverse in order to pursue an ill-fated flirtation with rock-n-roll glory. So, if I seem a little over-eager regarding their partnership, it’s due to the fact that I grew up with both Holmes and the Doctor and never thought they’d join forces. But they did, and here it is. And it’s rather splendid. Unfolding in London, India and on the wasted planes of far-off R’lyeh, All-Consuming Fire is a story of forbidden tomes, strange libraries, murder, planetary invasion, familial betrayal and ancient god-like beings, all of which are wrapped and bound together in an absorbing and involving multi-layered mystery. 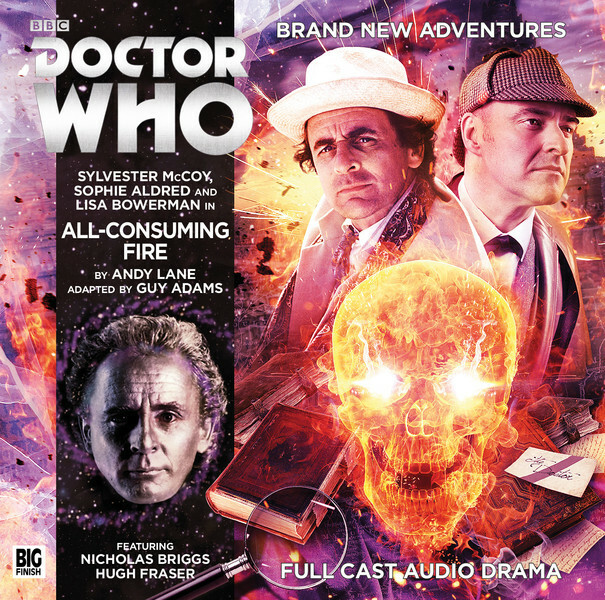 Taking Holmes into uncharted territory, it delves deeper into the Seventh Doctor’s conflict with the Elder Gods and beings, and it’s many interwoven Lovecraftian themes provide an intriguing setting in which both heroes are pushed to their limits and come to rely on each other in much the same way they rely on their companions. Combining cosmic horror, steam-punk driven science fiction, pulp adventure and the cerebral criminal fiction that Conan Doyle’s most famous creation became famous for, All-Consuming Fire also fuses the best of the aforementioned Lovecraft with Edgar Rice-Burroughs, yet at the same time retains a vibrant and wonderfully imaginative originality.